These skins were made by converting the inky md5 mesh into .obj format, then importing them into blender and screenshotting the UV unwrap. Maybe there is a better way to do it than by editing a low-res screenshot from blender, but I couldn't think of one. Anyway, these skins are HIGHLY visible, but sometimes hard to tell which direction they are facing. Also, these skins *will* affect hudgun hands, as inkies have no separate skin for first-person hands. Not intended to be a serious mod, these might be the sort of skin you play around with for a week or so then go back to the originals. I normally don't post something i consider to be low quality, but there are almost no inky reskins out there so I feel compelled to share this. Now with semi-transparent colors between the vector lines. I discovered how to export a UV unwrap layout as a .png from Blender, and it has allowed me to get much sharper skins. 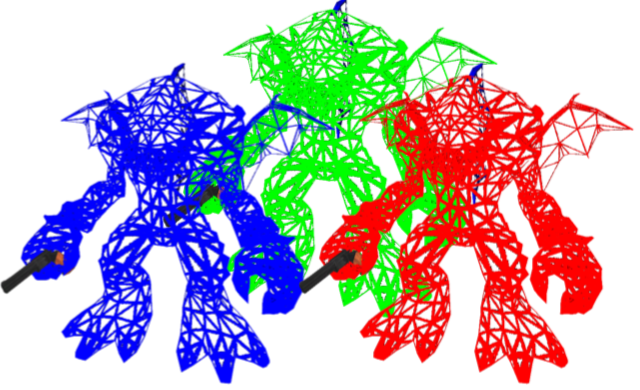 Uploaded Mk 2.0 version... with fullbrightmodels off, they look like a sort of gummybear/cthulhu hybrid.